We get European Hornets in our garden quite a lot once summer gets going. 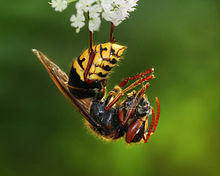 However, there is lots of talk about Asian Hornets at the moment in the news. Apparently the French accidentally introduced them to Europe in imported plants and they are attacking French honey bee colonies. The Japanese honey has an amazing defence against them though, as can be seen from this video - well worth looking at this! Although this article is from 2007, it is one of the most informative on the subject. This article from this month's Telegraph gives the latest news on the subject too. Hopes are that these Asian Hornets do not cross the channel.